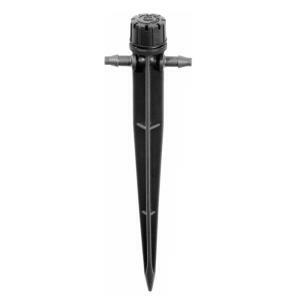 Antelco In-Line shrubbler is an adjustable stream dripper that can be installed in a continuous run of micro-tubing. Simply twist the cap to adjust the flow and the coverage area from 0 - 14 GPH covering up to 3' diameter. To use the in-line model just connect your micro-tubing to one of the barbs on the stake then push stake in the ground then attach another section of micro-tubing to the other barb and run to the next plant and add another dripper. Repeat as needed for your system design. Please note the adjustable drippers use a lot of water and you will not want to exceed the tubing capacity. Our 1/4" (.170" ID x .250" OD) micro-tubing has a maximum flow rate of 30 GPH and a maximum single run length of 30'. See our Tubing Buying Guide for more details.